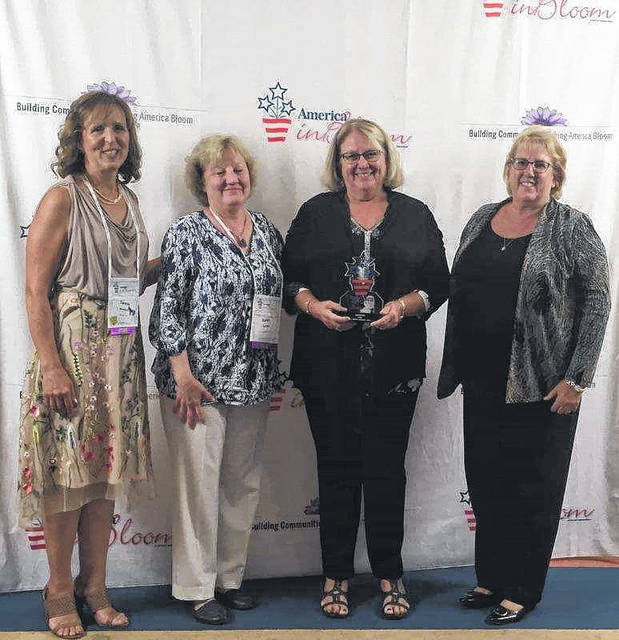 From left to right, America in Bloom Judges Teresa Woodard and Karin Rindal stand with Gallipolis in Bloom representatives Bev Dunkle and Kim Canaday during the America in Bloom Symposium and Awards Celebration in Holliston, Mass. HOLLISTON, Mass. — Gallipolis in Bloom for the second year in a row was declared the winner of America in Bloom’s Circle of Champions for small communities over the weekend at the America in Bloom Symposium and Awards Celebration. Holliston, the location of the symposium, is roughly 25 miles from Boston in Massachusetts. The symposium travels to new locations every year across the country as America in Bloom serves as a national beautification, horticultural and heritage competition. This was GIB’s eleventh year participating. “To win the small town division twice really surprised me,” said GIB President Bev Dunkle. GIB walked away with a four out of five bloom rating. The score is determined by the overall judging of a community’s collective efforts to meet AIB standards over six categories. Those categories include floral displays, environmental efforts, urban forestry, landscaped areas, heritage preservation and overall impression. Canaday said Gallipolis is traditionally strongest in its floral displays throughout town as well as its historical heritage preservation. She said GIB needed to step up its efforts in urban forestry, however. Canaday said she would like to see GIB increase its environmental efforts presence as well. Canaday said the Gallia Soil and Water Conservation District had an annual tree evaluation. The volunteer coordinator said GIB would potentially like to get involved with the district’s tree identifying efforts. The kind of signage needed for GIB’s efforts though is somewhat expensive, according to Canaday.